MWSnap is freeware, but your donations are gladly accepted. I'd appreciate your help in translating the program to other languages! "Wow, what a fine job you did in making MWSnap!! I have been completely amazed at how many features it has for such a small program! In fact, each time I checked to see if it had another feature that I was looking for... there it was, exactly as I hoped it would be!!!! I have not found any other screen capture utilities to match it. I love the way it automatically saves each captured picture to the folder of my choice, and in the format of my choice, so that I can keep capturing without having to bother with naming the files or telling it where to put them. I could go on and on... it has so many good features! Even the help menu is great! Thanks so much for taking the time to make MWSnap!" "I thought Screen Seize of PC Magazine is the best and smallest program for screen capturing, but after running MWSnap I found it a much better application. I would rate it 10/10 for its usefulness and compactness." 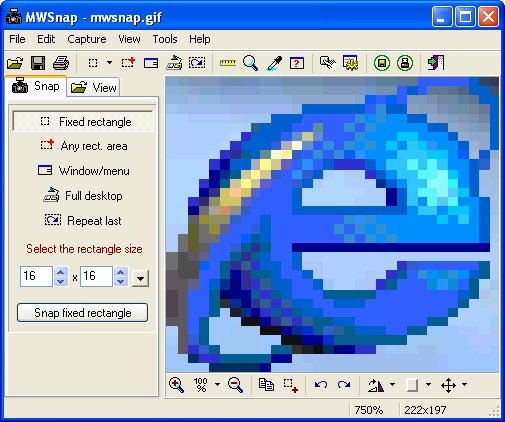 "I just want to thank you for your freeware program "MW Snap v 1.10". It is helping me tremendously to take snapshots from data - graphs (charts) on my screen. Thank you so much for your nice piece of software. I searched on the net for programs like the one you made, and I must admit: The most important thing is not that your program is for free ... But the great thing is that your little screenshot program is just THE BEST !!!!!! It has very nice features and produces no software bugs (at least not on my PC). This is important because I'm running software full of financial data on my computer and the last thing I need is software bugs or crashes. Thanks again for this tremendous piece of intelligent work." "I thought I would write you a quick email to say thank you for two such great programs as PINs and MWSnap! I downloaded them from your web site almost a week ago - and have used both of them daily since!" "What a joy to download software that is short (and easily downloadable), does the job (VERY WELL! ) and it's FREE. You're too good to be true. THANK YOU." "Just want to say up front that this is by far one of the easiest to use and functionally perfect "screen shot" programs I've encountered. Better than the ones that I paid top $ for!" Repaired and restored the "Start minimized" option. A new option "Minimize on Close". Clicking the icon in the tray restores minimized program and minimizes the restored program. A new color picker tool. Preview panel can be hatched to improve the image visibility. A new configuration option - restore MWSnap after snapping. A new configuration option - always show program icon in tray. All dialog boxes save and restore their last screen positions. An error with the preview window appearing on the captured images removed. Repaired errors with minimizing and restoring. Repaired bug with repeating the last capture. The option "Start minimized" has been temporarily removed! An option for automatic checking if a new version of the program is available. A new version of the ruler tool, featuring higher accuracy, dynamic readings, and a bi-directional scale. Accept files dropped on the program window. Many minor bugs and translation problems removed. Adding mouse cursor pointers to snapped images. Adding configurable frames to snapped images. Color picker - F4 key opens a dialog box with color details and several popular color notations (RGB, HTML, Delphi, and System). A new Window info tool, showing dynamically details of a window below the cursor. Ruler, Zoom and Window info tools are available in the local menu of the program's icon in the system tray. Ruler, Zoom and Window info tools can be invoked using system-wide hotkeys. Repaired bug in saving transparent GIFs. The ruler tool no longer causes MWSnap window to minimize. Dialog windows restore their last positions on the screen. Opening picture files, with support for gif, png, jpg, bmp, ico, emf and wmf formats. Picture Viewer panel, with options for opening, starting, renaming and deleting pictures. Pasting images from the clipboard. Numeric pad '+' and '-' keys perform zooming in/out. Ruler tool - right-clicking the ruler pops up a local menu. Auto-saving shortcut remapped to <Ctrl+Alt+S>. Removed the obsolete 'stretch preview' option. Repaired bug with repeating of the last capture. Support for PNG images format. Improved color reduction algorithms in saved .bmp and .gif images. Repaired bug that could cause the marking rectangle to go into the snapped image. Support for multiple versions of the same language. Possibility to translate the user interface to any number of languages. Window snapping - possibility to capture child windows. Configurable displaying of the snap preview window. Printing - possibility to specify the count of copies. Windows XP Themes Manager compatibility. Enhanced visibility of the selection window. Repaired bug causing settings not to be saved. Repaired bug with rotating snapped images. Corrected snapping of maximized windows. A bug removed causing MWSnap in some cases to crash at startup. Auto-saving after making a snap. Basic transformations: flipping and rotating. Show/hide preview window (F6 while making a capture). Preview box, zoom tool - an additional marker showing an exact cursor location. Ruler with scale markings on both sides. Application title bar shows the name of the last saved image.